I have the honor and privilege of being the Fire Chief of this great department and am grateful for all of the support given to me from both members of the department and the public. On behalf of the dedicated men and women of the Salisbury Fire Department, I would like to say welcome and thank you for taking the time to visit our website to learn more about our department. Since 1872, we have been working to keep the citizens, businesses and visitors to our community safe. 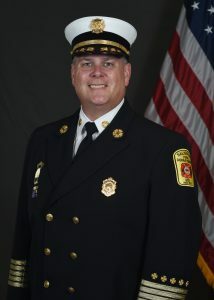 We accomplish this through focusing on the mission first and applying our core values in all we do to enable us to reach our vision of becoming the fire department that provides the very best fire protection and EMS care in Wicomico County, on the Eastern Shore, in Maryland, and in the U.S. This is brought to pass through the success of our people and with a focus on creating a department that has tactical equality; which is to have both career and volunteer components have an equal role in the department, promotional equality; which means that both career and volunteer components have an equal standard of knowledge, skills, and abilities, and developing diversification strategies that recognize the great talents of our people and their individual contributions to the department and our community. We hold ourselves to a standard of taking pride in all we do, conducting ourselves with a high degree of professionalism, being proficient in our delivery of service, and finally remaining personally accountable for our actions. We consider ourselves fortunate to have the support of our citizens and elected leaders, as they remain committed to providing us with modern equipment, “state of the art” training and functional facilities. Our combination system of career and volunteer members provides the most cost efficient and effective emergency service to our citizens and one that the community can take pride in knowing that the dedicated men and women of the Salisbury Fire Department stand at the ready to respond in any time of need. I invite you and your family to learn more about the Salisbury Fire Department and the services we provide. Should time allow, we also invite you to visit any one of our three fire stations. In closing, the men and women of the Salisbury Fire Department are proud to provide a tradition of excellent public safety service to the residents of the Salisbury Fire District. If you’d like to comment on or inquire about any of the services that we provide please feel free to contact me at 410-548-3120 or by e-mail at [email protected] and please feel free to browse all of the sections of the new website.